East Texas, geographically speaking, is the region east of a line that follows the old cotton centers of Texarkana, Paris, Corsicana, and Palestine through the lumber hub of Lufkin and on to the Louisiana border. These rolling pine forests of high and dense canopy are where Texas meets the Deep South. North Louisiana and East Texas formed the heart of the Caddo nation, the indigenous culture that peacefully inhabited the forest until the Spanish and French began jockeying for control in the early 18th century. When the tide of disaffected Tennesseans and Georgians began riding into the territory 100 years later, the tribes and outposts were permanently disrupted. As rendered in literature from Fehrenbach to Michener, the new Anglo-Saxon interloper was fiercely independent, running from most forms of cultural enclosure. Two hundred fifty years later, attitudes toward governance remain mistrustful and jaundiced of “culture.” In this space, what is the place of design and urbanism? 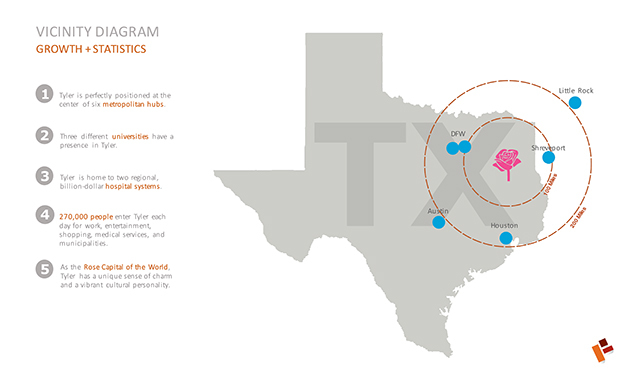 Look at the heart of East Texas, and you’ll see Tyler. Claiming heady and steady growth even before the oil boom of the 1930s, the seat of Smith County is the center of gravity of the region. While the city of 104,000 (the county’s population is double) is archetypal East Texas, its prosperity as a center of commerce and finance afforded the center city a slow and ordered growth model that resulted in a downtown grid with two office towers, an extensive inventory of commercial structures on the periphery of the central business district, and prewar neighborhoods such as the Charnwood and Azalea districts. Philanthropy shaped otherwise unattainable amenities, and self-awareness drove the desire for higher education at Tyler Junior College. Tyler is hardly idyllic, having had its share of cultural strife and in recent years struggling with its own vision of the future. Downtown had become stagnant and shackled to a vacant center square (previously the site of 1909 courthouse). Integrated commerce and human scale was replaced by big boxes on the edge of town and unwieldy sprawl. The city engaged Goody Clancy of Boston to undertake a comprehensive planning process, titled “Tyler 21”, but only a handful of its proposals have been implemented. Enter Fitzpatrick Architects, a growing, 23-person firm founded in Tyler in 1986. New hires at the firm sought living accommodations in the center city, where none were to be found. This realization inspired founder Steve Fitzpatrick, AIA, and partner Brandi Zeigler, AIA, to embark on a thought experiment: Could design rejuvenate Tyler’s downtown? In an impasse where the private sector and public sector were each waiting for the other to act, why not dare to lead with probono alternatives and schematic ideas for a livable and vibrant urban core? The firm had, on occasion, implemented site specific and interiors projects in the downtown district and, with 30 years in practice, possessed a wealth of local knowledge. 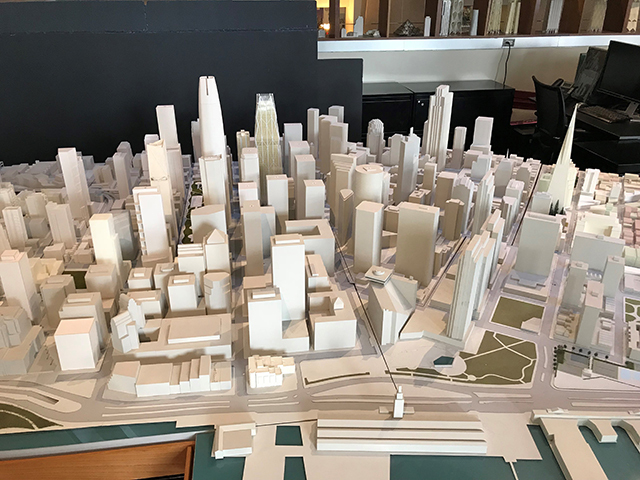 As with any site study, data collection forms the foundation of the design process, the team created a digital model of the urban core, complete with representative topography. While the “Tyler 21” study was rich with process, large-scale diagrams, data, and principles, it offered minimal three-dimensional speculations and only one street-level rendering. The architects incorporated the Comprehensive Plan as a guiding document, however, and have focused on several of its observations and conclusions. They wisely introduced their endeavor to City Manager Ed Broussard and County Judge Nathaniel Moran early in the process to create allies and avoid misunderstandings about motivations for the work. A prominent proposal of “Tyler 21” was to launch center city improvements from gateways, and in Tyler’s demography, the obvious choice was the Broadway Avenue approach to downtown from the south in a five-block expanse of four lanes with off-street parking. 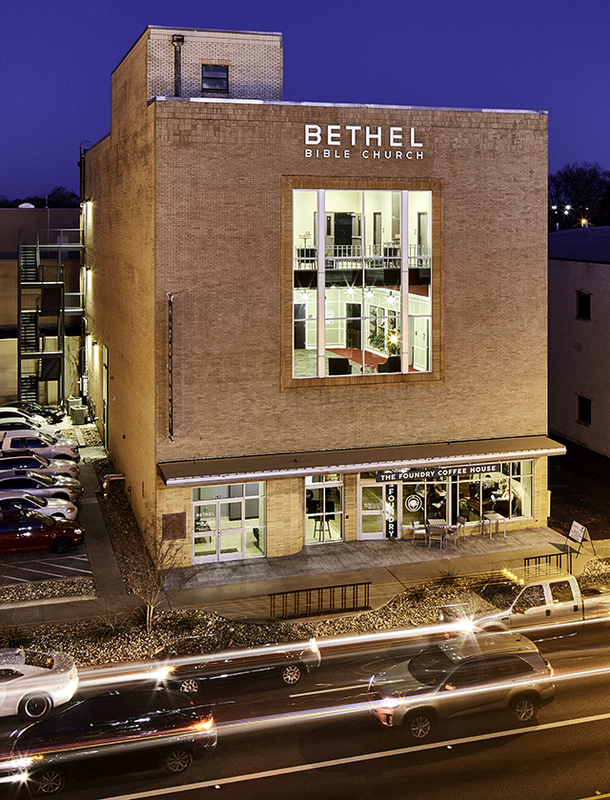 This stretch of commercial frontage is an eclectic assemblage of notable churches, midcentury midrises, and buildings of historic importance —in many ways inventory with potential. The team created their digital model at the old city square and then moved south along Broadway. In consultation with a traffic specialist, they envisioned the thoroughfare as a calmer three-lane road with a bike lane, parking pockets, pedestrian accommodation, and landscape befitting the region. Their model permits visualization of the development along the street in time-lapse, invaluable in translating the feasibility to policymakers and other stakeholders. Broadway begins a gentle rise up to the single-block square where a 1909 courthouse stood until demolition in the 1950s. Today, the site remains an awkward void whose primary purpose seems to be facilitating parking around its perimeter. On the east side of the square is the Smith County Courthouse, long recognized as inadequately serving the needs of contemporary county services. 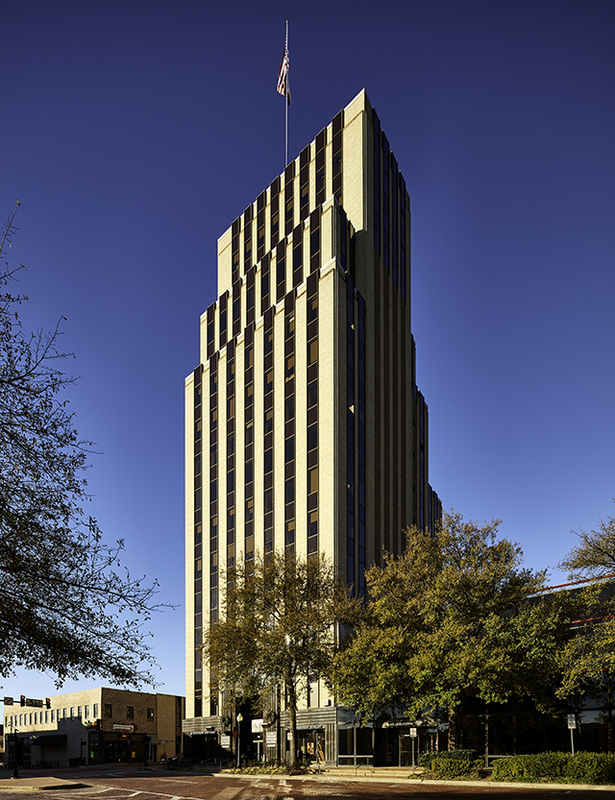 On the west side are the two tallest towers in Tyler, the 15-story People’s Petroleum Building (originally the People’s Bank Building, 1932) and the 19-story Plaza Tower (originally Peoples Plaza, 1979). Forming a periphery around this core is 30-square-block assemblage of two- and three-story commercial buildings and empty lots. At the north edge of downtown is the 1905 Cotton Belt Rail Depot, now a museum. There are numerous vacant parcels and underutilized properties in this zone, notably the courthouse square and the site of a former automobile dealership. The proposed model demonstrates aspirational uses for these sites. 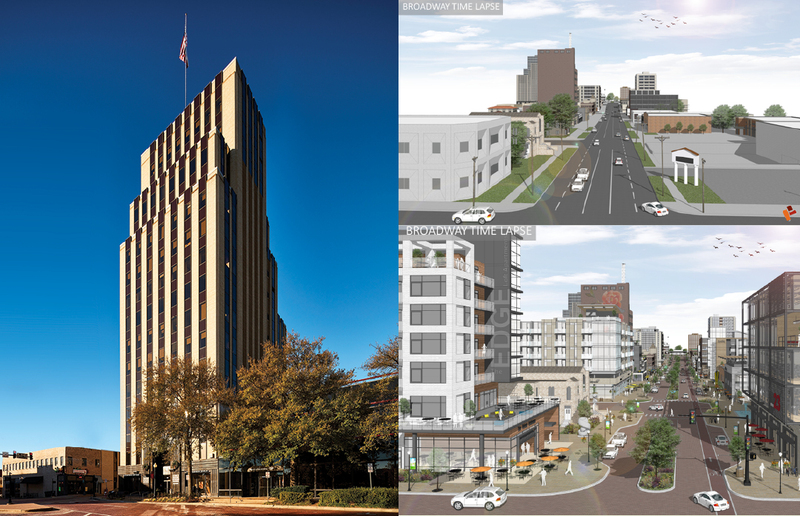 “Tyler 21” recommended the placement of a central public parking structure downtown to serve the broader need, and the municipality has followed through, with a four-story parking deck on Broadway Avenue. Taking the pressure off traditional surface and off-street parking, such concentration of parking will pave the way for higher-use innovation in public and private space. The architects’ boldest gesture is their proposal to move the Smith County Courthouse two blocks to the east between Fannin Avenue and Center Avenue. The model maintains a row of archetypal town square buildings between the current and proposed site, but the ultimate development is visualized to be a three-square-block public space that speaks to the urban engine Tyler has become. The elongation of this core offers vastly more in terms of scale, axis, the dance of each edifice and space between. One of the tenets of contemporary urban thinking is the likely increase in property values on the perimeter of open space, or at least vacancy that is loved. The model offers, with commodity and delight, a way for the city center to incrementally develop without overwhelming stakeholders. There are a number of projects being implemented in the downtown district, which are the desired outcomes of “Tyler 21.” The art deco People’s Bank Tower, banking lobby, and mezzanine spaces have been extensively renovated into a thriving upscale restaurant. 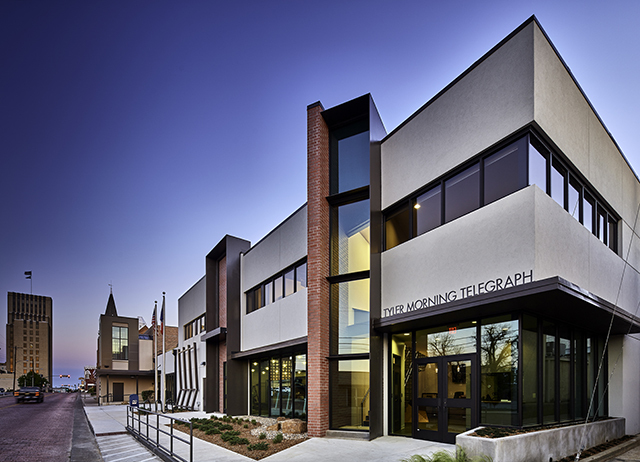 The tenured offices of the Tyler Morning Telegraph, whose owner, Nelson Clyde, has demonstrated a notable commitment to the city, has been updated, along with repurposed aged commercial space for the Bethel Bible Church. Additionally, Tim and Garnett Brookshire, of the expansive Brookshire’s grocery chain based in Tyler and known well throughout the East Texas (and owners of the downtown towers with partner Andy Bergfeld), have exchanged ideas with local architects. The first stone in the foundation of any viable 24-hour downtown is, of course, a storefront with milk, bread, and cabernet. The Fitzpatrick model avails itself of a not-so-obvious opportunity for mass transit—one that many cities want but can’t have: Running south from the old depot is an abandoned rail line that traverses the southeastern quadrant of Tyler, passing through the medical district, adjacent Tyler Junior College and the University of Texas at Tyler campus. Whether as a pedestrian parkway armature, dedicated bus service, or, if swinging for the fences, a tramway, this right of way will someday be a valued amenity in Tyler’s urban fabric. The architects see their narrative as ongoing, applying the principles of “Tyler 21” and presenting them in a way that can generate the heat needed to jump from ideation to livability. Clark Manus, FAIA, my pal and former AIA president, has the 1980s version of this communication tool in his San Francisco office, Heller Manus. 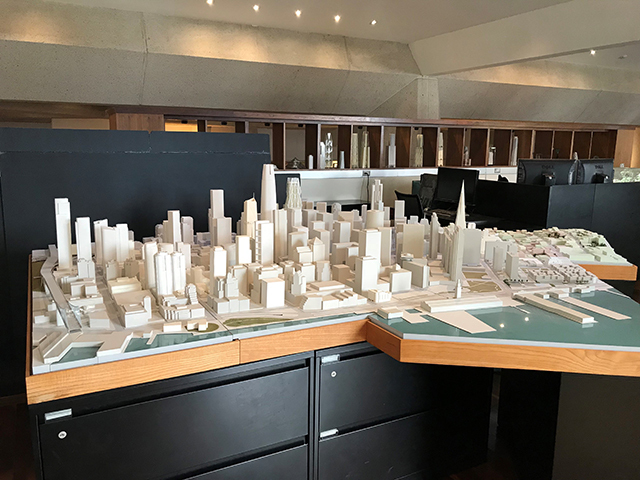 A 200-square-foot model of downtown San Francisco in obligatory white abstraction, the firm’s high-rise and other urban achievements are featured in black counterpoint. If Fitzpatrick’s foresight and ability to translate ideas into understandable and inspiring images result in authorship, it will be well-informed and well-earned. All communication is about the audience, and the architects should now apply the same care for the northern exposure and gateways to downtown, analogous to the many explorations of the relationship between downtown Dallas and Fair Park or the Cedars districts. The connectivity of underserved neighborhoods in north Tyler is a vacancy with greater challenge and less familiar imagery; it is nonetheless crucial to the long-term success of any plan at this scale. Fitzpatrick Architects has filled a void with its initiative to communicate the potential of Tyler’s Comprehensive Plan, specifically as it applies to the center city and to its stakeholders. City Manager Broussard says, “Fitzpatrick Architects took a communal interest in the city and its comprehensive plan. Once we saw their model, we had an idea of what downtown could be. The images taken from the model have added another dimension to our grant-writing process. When working with developers, it helps us communicate our guidelines and shape incentives that may be part of their project.” And the architects have completed works in the downtown district that add voices to the chorus. Perhaps more than either of these, they have presented a generous alternative to the precedent that holds planning and design-thinking suspect, and in their imagery, confirm that quality of life is simply not accidental. If this is the case, then Tyler can claim another reason to be known as the hub of East Texas, and architects will have elevated the value of design in this place. 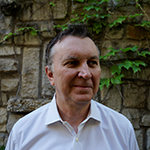 Jeff Potter, FAIA, is founding principal at Potter, past president of AIA National, and president of the Architects Foundation.